The Peer-to-Peer UX Design Reviews + UX Office Hours takes place on the first Monday of the month at 7pm sharp at BLANKSPACES SANTA MONICA. 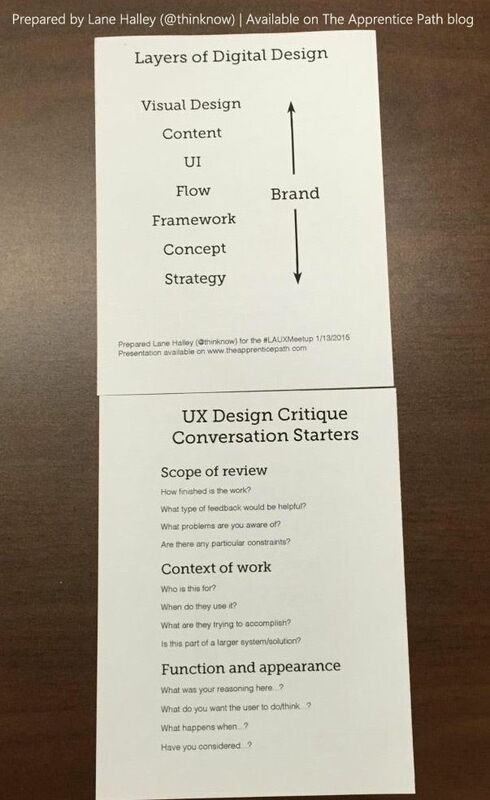 Please come planning to help your UX peers by contributing to the review session. We will be reviewing each-others’ work, providing helpful feedback and have an open discussion of the evening at the end for a peer-driven conversation about emerging UX developments and concerns. Occasionally, the gathering will be a “no host” event. Regardless, please meet to give and receive useful feedback to each other. By regularly attending these gatherings, you’ll have the opportunity to strengthen your connections within the local UX community, improve your work and polish your communication skills. The ability to self-organize (see the Principles behind the Agile Manifesto) is an important one. Use this opportunity to work on your self-organizing team skills as you provide helpful feedback to each other. Also, feel free to bring friends, co-workers, your mentor or those you are collaborating with. In addition, Ikponmwosa (I.K.) Olomu is offering one-on-one UX office hours​. To meet with him, please let him know you are coming him in advance. Just leave a message in the comments area below. • We will be starting at 7PM sharp so plan to arrive at 6:45PM. • Once you have signed-in, make sure your computer is ready to project your work using the monitor display. • Don’t forget to bring any dongles or adapters you might need. • At the beginning of each meeting, we will use 15 minutes for everyone to introduce themselves. Please prepare a 30-second introduction about yourself and/or your project. • During the introductions, share your name, what you do (designer, developer, etc. ), and what kind of help you need. • Each presenter will get 15 minutes of time. I recommend that you use 7 minutes to present and 8 minutes for feedback. To help you keep track of time, we will set a timer and let you know when to stop. • If you want to present, please mention it in the comment section below. At the event, be sure to add your name to the presenters’ sign-in list on the whiteboard. We will continue to iterate on the format as we go. Can’t wait to see you there!